Apples are a leader when it comes to organics with more than 10% of the category being organic. They make up 7.8% of all organic produce sales and bring in nearly $400 million in sales. With a wide variety of options, the organic apple category can boost your department’s overall organic sales. For more information on variety characteristics, visit our conventional apples page. Apples are popular year-round but sales peak in the fall when the new crop comes in. This is true for both conventional and organic product. Take advantage of consumer interest in the fall by marketing apples with other organic items, including baking supplies and dips. Organic apples lend themselves to green marketing promotions. While organic produce of any kind can not be marketed as healthier than conventional produce, the growing practices used in organic production can be promoted as better for the environment to your environmentally conscious consumers. You can also market organic apples as being grown using sustainable practices that result in fewer chemicals making it to the store on the apples. If you source organic apples from a local orchard, be sure to make that a prominent selling point in your display to attract consumers who want locally grown produce. Include organic apples in winter holiday promotions and especially in New Years’ promotions aimed at health-conscious consumers. Consider offering samples of organic apples to give consumers unfamiliar with organic options a taste. Sampling offered by a knowledgeable staff member also gives you an opportunity to explain the difference between organic and conventional product to those who may be unfamiliar with the distinction. Price is one of the biggest obstacles to increasing organic apple sales, especially of already more expensive proprietary varieties. Consider posting signs near your organic apples that explain the added labor that goes into organic production, which can raise the prices. You can use some of the same strategies to market organic apples as you use in your conventional displays, along with some strategies unique to organics. Offer consumers plenty of choices. While the market for organic apples may be smaller than that for conventional product, creating a display that includes several varieties will appeal to all types of consumers and will help move apples off the shelves. Decide if you want to place organic product next to your conventional product or set it aside in a section by itself. Some organic apple varieties are close in price to the same conventional variety and my do well when displayed side by side. Other apple varieties have a higher price markup and may suffer from being displayed next to their conventional counterparts. You may want to try a few different options to see what sells best in your department. Remember, when displaying conventional product next to organic product, barriers need to be in place to prevent the conventional and organic product from touching. If you have a large apple display, considering displaying conventional apples on one side of the aisle and organic apples on the other side. This creates an attractive display and avoids accidental mixing of product. Display apples on refrigerated tables to keep them looking fresh. Avoid stacking product too high as too much weight will bruise the apples on the bottom layer. Keep displays well-stocked and remove damaged product immediately. Clearly mark apples as organic. Consider offering bags or clamshells of product along with bulk options. Whether displayed in an organic section or next to their conventional counterparts, apples create a vibrant color break within your department. Many shippers will custom pack in poly bags, mesh bags, clamshells, traypacks, tri-wall bulk bins and RPCs. Sizes vary according to customer specifications. 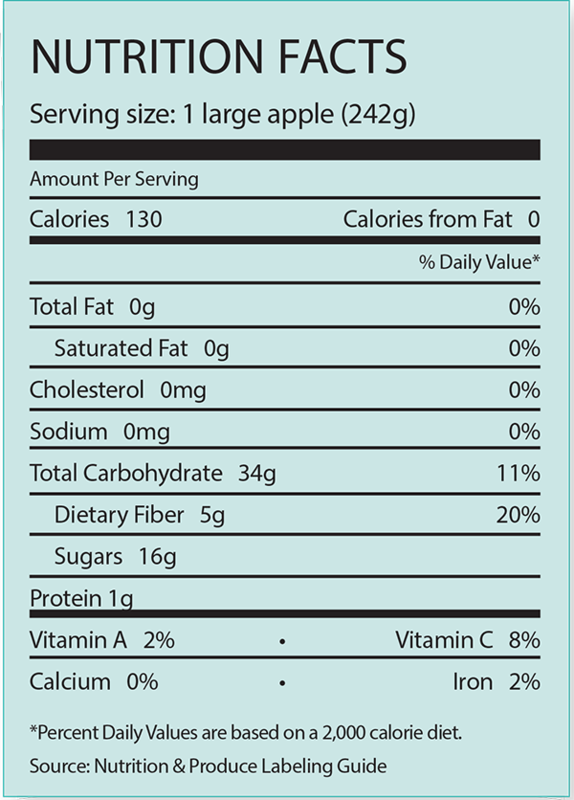 Sliced apple packs are a consumer favorite and are available from shippers in a variety of weights and units, with 2-ounce single packs and 12-ounce bags being common options. Washington grades are a higher standard than the corresponding U.S. grade. Washington has implemented minimum internal condition standards for all grades of delicious apples. Moderately sensitive to freezing injury. It is especially important that controlled-atmosphere apples are refrigerated at the proper temperature because they are more susceptible to becoming mealy.